I have a fresh organic vegetable delivery every week, most of the year that comes from Southern Roots Organics (a local Community Supported Agriculture scheme) but between February and July, when Southern Roots are busy preparing for the coming season I buy my vegetables from Riverford. This week I had a huge bunch of carrots with their tops still intact, I promptly cut the tops off and went to put them in the bin when I remembered it is possible to make carrot top pesto. Because this is a vegan recipe it doesn’t have any Parmesan, so to get that slightly cheesy taste I added nutritional yeast and Miso paste. 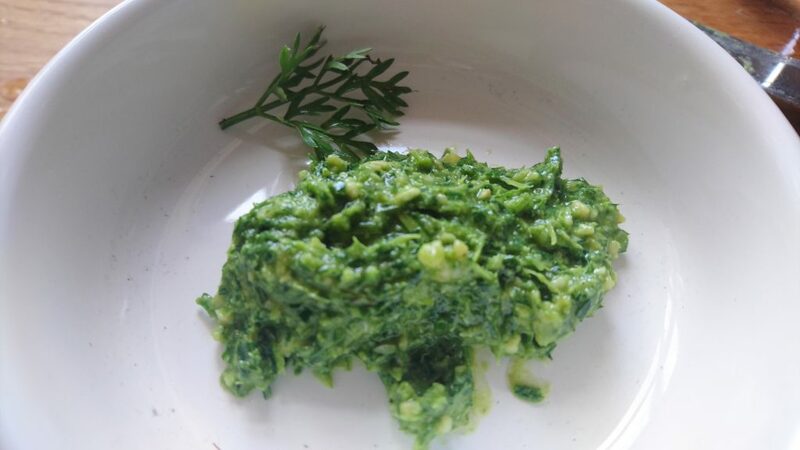 Put all of the solid ingredients into a food processor and blitz, dribble in enough oil to make a regular pesto consistency, you will probably need about 100 ml of oil. You can use the carrot top pesto exactly the same as you would regular pesto, tonight mine is going on a pizza!